Nothing is without a sacrifice. Tangible or not, almost everything seems to carry a heavy tax; time. Whether we pay entirely in time, or it’s levied, time is paid. This much has become apparent. The day job never really let up around this time last year. I thought the hectic period was temporary, but I was wrong. Then again, my efforts at work weren’t in vain. I’ve been given a lot of opportunities, all of which I’m very grateful for. And although I’m content, I miss writing. I’ve said this before. These last few entries have pretty much been around the same thing; how much I miss writing, and how busy work is. And so it comes down to a few things; desire, dedication, and time management. I know one can finish a novel in a year. I know of people that can write MANY novels in a year. They have hectic busy schedules too, they have personal obligations, they have a regular life. It can be done. Deadlines, when it comes to art–when it comes to writing, has never been my forte. Heck, I’ve written at how discouraging NaNoWriMo can be for me since I just can’t handle that sort of pressure. I fall word counts behind and then it just snowballs. I can never catch up and the whole thing goes up in flames out of frustration. Even though structure, even within the NaNo deadline and daily goals, have not worked, perhaps I should give it another try. I mean, structure works for me when it comes to outline. I LOVE outlining, even if I don’t follow it completely in the end. Sometimes the story flow changes as I write and I allow myself room for that. A friend of mine, Jeffe Kennedy, teases that my outlining is a form of procrastination. I have no doubt it is, but not always. It does help me. It allows me to see overall themes and story. Everything is else comes naturally. That’s where the ‘art’ comes in. New year resolutions have never been my thing, so I won’t say that’s what this is. However, I hold on to hope that I’m able to pick up new habits. 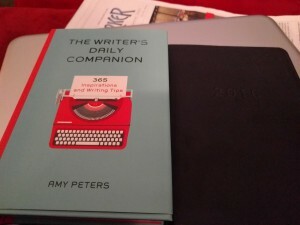 I have a planner for next year and a “writer’s companion” book to help keep me on track. Plus, I have a wonderful gift from Marcella on “the 90-day novel.” I’m optimistic. Next year will be a challenge. I’m set to train in Texas for a few months. I’ll miss Seattle TREMENDOUSLY, but I also hope my time spent in a lonely hotel will keep me focused. Hopefully I come out of this with a couple novels. Everything is pending. It’s all staging. This entry was posted in Rants/Musings, The Writer In Me. Bookmark the permalink. Looking forward to hearing what a great year 2016 will be. Also what part of Texas will you be in?